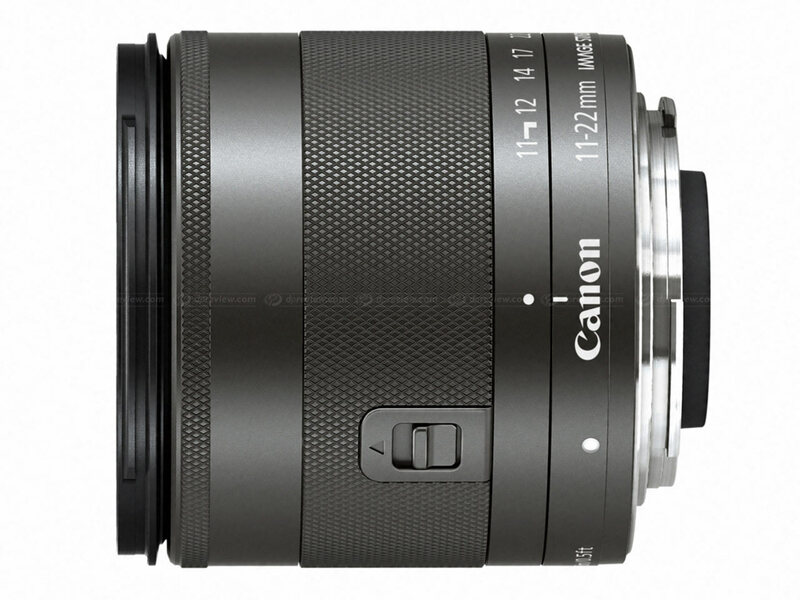 Canon has announced the EF-M 11-22mm f/4-5.6 IS STM - an image-stabilized wideangle zoom for its EOS M mirrorless camera. It's Canon's first wide zoom with IS, promising three stops of stabilization for stills and 'Dynamic IS' for video. A linear stepper motor offers silent autofocus during movie shooting, and a retractable barrel design makes the lens about the same size as the 18-55mm kit zoom when collapsed. It should be in shops at the end of June, at an MSRP of £379.99 / €399. We're told the lens isn't going to be available in the USA, at least for now. Canon has also announced a version 2.0.0 firmware update for the EOS M, which the company says will offer full compatibility with the 11-22mm (to prevent the camera from shooting with the lens in the collapsed position), and bring a much-needed improvement in autofocus speed with all lenses. The firmware will be available to download from Canon's support website at a date that has yet to be confirmed. 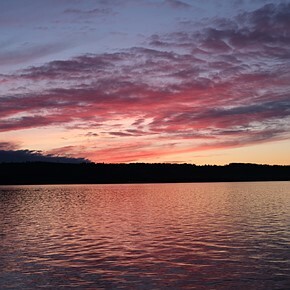 The 11-22mm uses a 55mm filter thread, which isn't shared with any other current Canon lens. 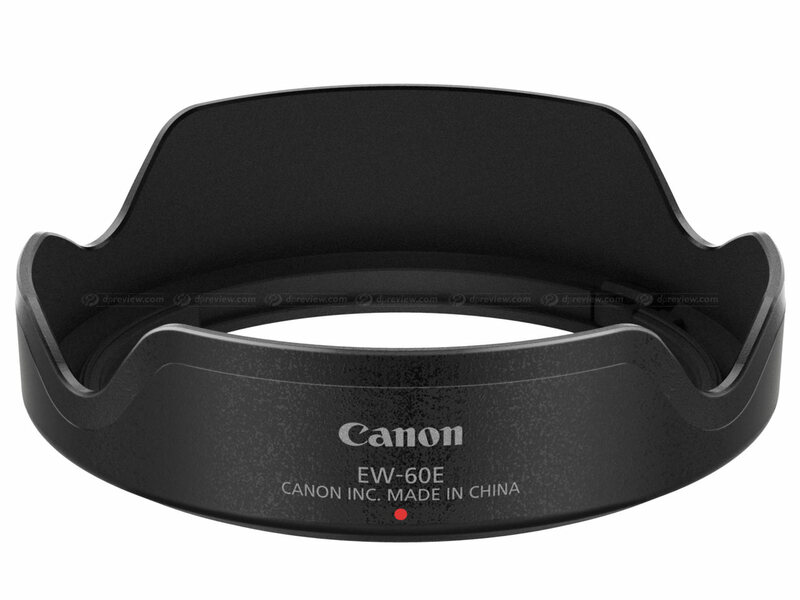 This means the company has introduced two new products to complement it - the E-55 front lens cap, and a 55mm 'Protect' filter. 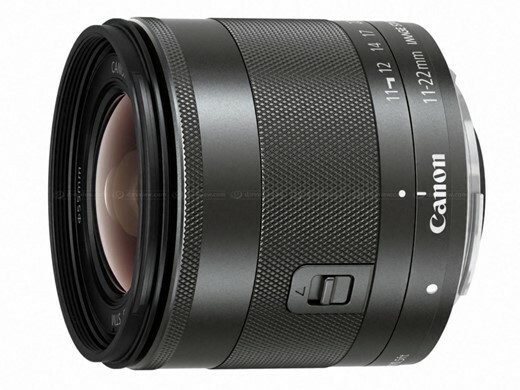 London, UK, 6 June 2013 – Canon today expands its range of EF-M lenses with the introduction of the new EF-M 11-22mm f/4-5.6 IS STM. Designed for Canon’s Compact System Camera, the EOS M, this is Canon’s first ultra wide-angle EF lens to feature an Optical Image Stabilizer. Offering a versatile wide-angle zoom range, first-class optical performance, and a new retractable design, the EF-M 11-22mm f/4-5.6 IS STM is the perfect addition for EOS M users who wish to capture their passion for landscapes and architecture. Designed to expand the range of creative possibilities and shooting subjects, the EF-M 11-22mm f/4-5.6 IS STM has an 11-22mm focal range which provides an incredibly wide field of view. This allows users to capture the environment around them whilst remaining close to the subject – ideal for adding drama and atmosphere to each shot. Engineered using the latest optical technologies, the EF-M 11-22mm f/4-5.6 IS STM enables users to capture images with incredible levels of detail and quality. Manufactured using Canon’s professional quality standards, the lens uses Super Spectra Coatings designed to minimise ghosting and flare, providing beautiful results with every shot. Images are crisp and clear thanks to Canon’s Optical Image Stabilizer, which works to keep image blur to a minimum by correcting camera shake. A 3-stop shutter speed advantage ensures high quality stills, even when light levels start to fade. Shooting smooth Full HD movies is easy using the advanced Dynamic IS mode which combats more exaggerated forms of camera shake that occur when shooting video on the move. Canon’s near-silent STM technology also ensures focus noise is supressed during movie capture, so the audience can enjoy crystal clear sound to match the visual quality of the footage captured. Incredibly compact and lightweight, the EF-M 11-22mm f/4-5.6 IS STM has been designed to fit easily into the smallest of spaces so it can be carried everywhere. A new retractable lens design – a first for the EF lens range – locked in place by a switch, allows users to retract the lens back into the barrel when not in use. 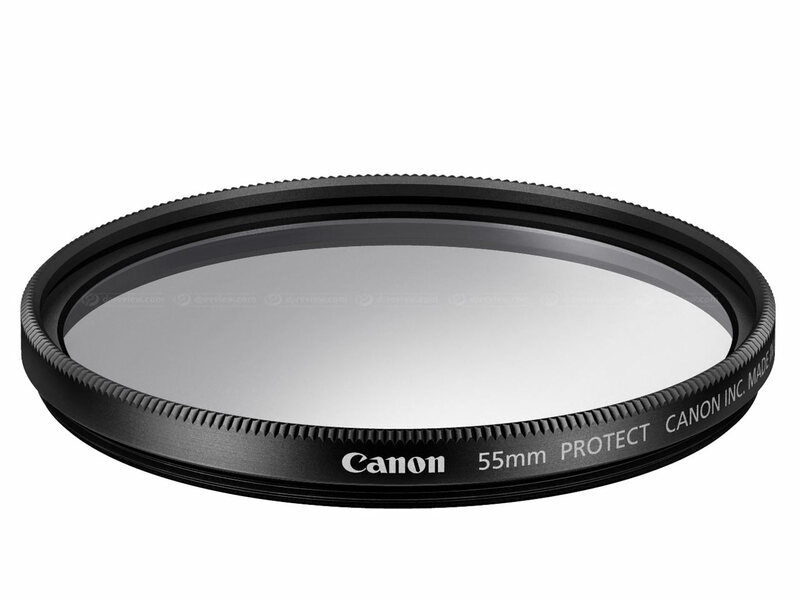 This keeps the body slim and compact, reducing the lens length by 13mm. An integrated full time manual focus ring also provides the freedom to make precise adjustments to focus as needed. Designed to complement the EOS M’s chic styling, the EF-M 11-22mm f/4-5.6 IS STM features a graphite silver, metal exterior, while the knurled focus and zoom rings are comfortable in the hand and provide easy operation. Before using the EF-M 11-22mm f/4-5.6 IS STM with the EOS M it is recommended that users upgrade the camera to firmware version 2.0.0 or later. Bought mine at Henry's, Canada for $399. Fast delivery to US and had a USA/Canada registration card. Very nice lens, excellent IQ. Virtually the same size as the 18-55. "We're told the lens isn't going to be available in the USA, at least for now." You are giving American's WAYYYYYYYYYYYY to much credit. £379.99RRP = US RRP of $379.99? If so that's cheap! It was written in the article above! Real incentive for getting an EOS-M. Also, other than incredible appearing a couple of times, more reasonable press release language than most. Probably the first mirrorless WA with reasonable pricing. Well done Canon! The very fine Nikon CX (Nikon 1) WA (6.7-13mm) zoom is under $500. It's also a first class lens optically, with metal mount, barrel, and zoom ring. The included hood is also well done. It's great seeing such appealing lenses at sensible prices. That's very very good pricing for WA zoom. Fantastic new option. I was really waiting for such a lens. Especially for landscape work it will let my little eos-m shine. 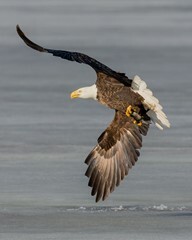 I use it mostly to have it with me every day and to complement my 5DIII with long telephotos when doing wildlife. Another copy of NEX lens? 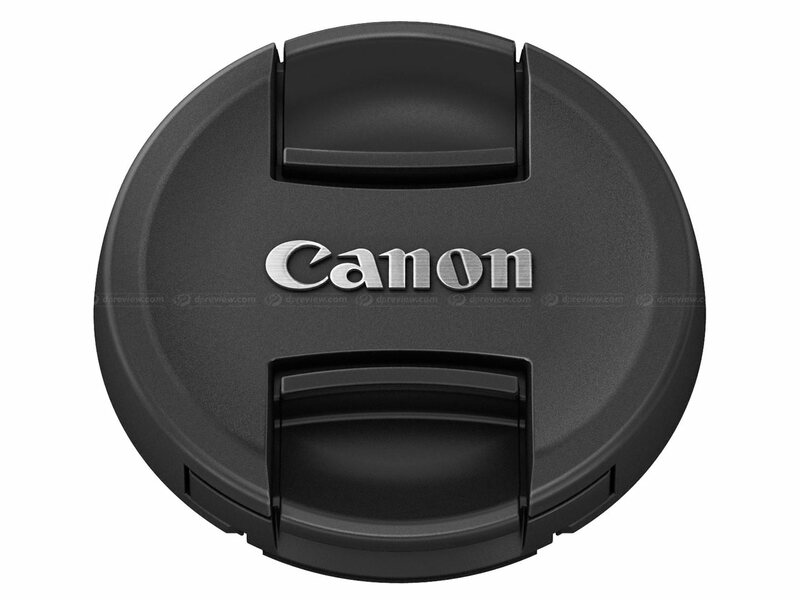 Can't Canon design any lens by themselves for EOS-M? And they buy everything from Sony instead???? How is this a copy of a NEX lens? I don't know of any Sony E-mount lens with the same focal lengths, the same lens elements etc. 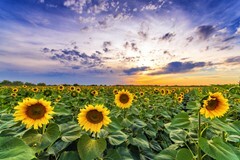 Are you thinking of the Sony 10-18mm F4 lens? They are both wide angle zooms, but they're clearly different designs. What medication are you taking, as this is the stupidest thing I've read in a long time. I think he meant the barrel-look, not optical specs or any other technical details. any info about size and weight? 220g, diameter 61mm, length 58mm. 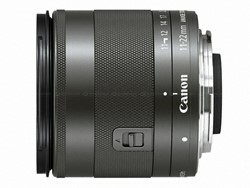 This lens (albeit a tad slow) looks like it might be good if Canon's claims about its optical abilities are borne out. It's just a pity there's not a first rate body to mount it on...... The reception to the first EOS M was pretty mixed. I thought Canon said that they were developing a Version 2 that was more enthusiast-oriented? 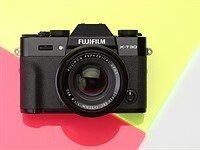 If Version 2 is an enthusiast's mirror-less camera, good lenses might take some competition to Fuji and Sony. Well I think if your only going to use this lens, the current body im sure is fine. the DOF for this lens is going to be huge. 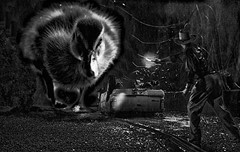 Huge depth of field is usually how you shoot an ultra wide, or up close with shallow depth of field. Otherwise APS-C is the wrong sensor size, get a full frame and a 16-35 or 14-24mm f/2.8 if you want wide and shallow. All I know is I would rather carry this 11-22mm if I was planning on shooting at f/8 or f/11 on those lenses anyway. This will have the same fate as the Nikon "1" system... Oblivion. Kodak introduced the pocketfilm 110 in 1972. My father made lots of slides in kodachrome with his Pentax Auto 110 (SLR) until they stoped produktion in 1982. That was 2 years fun with kodachrome with this camera. Some 110 Film was available until the end of the century but only in ISO200. An even greater flop where 126 film and Kodak Disc. And then don't forget APS-film! 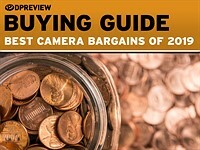 You mean the Nikon 1 "blunder" that has Nikon in third place worldwide in mirrorless? Or did you mean the Nikon 1 "blunder" of creating the only MILC in the world that has decent AF tracking and frame rates that nobody can compete with? As far as the EOS M, it's a first generation camera. But it's still capable of excellent IQ and video quality. 1) Nikon engineered the hell out of that thing. After taking into account the sensor size (yeah I know) it is a remarkably capable camera. 2) Never underestimate a marketing budget. Ashton Kutcher can sell widgets but he don't come cheap. 3) Do not try to understand what sells in Asia. It just does. Serious about this. The Pentax Q is still around. Why? Someone is buying it, and I can tell you they don't live in Pittsburgh. 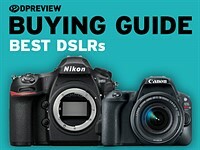 Nikon just had 8-page full-color INSERT in USA Today, partnered with Best Buy. Not a cheap ad buy. I think every model from entry level P&S to full-frame D600 and D800 was included. The Nikon 1 is far from dead. 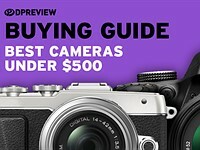 Sales are quite decent, especially in Asia, where far more mirrorless systems are sold. 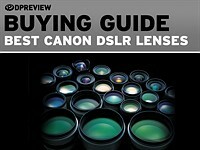 The lens selection isn't competitive with MFT, though prices are usually lower. 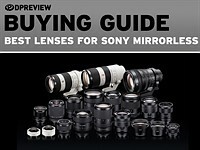 There aren't as many lenses as there are for NEX, either, bit quality is mostly better and prices lower (discounted clearance Sigmas being an exception.) Nikon has been introducing new lenses regularly and most of them have been very fine (and beautifully made). It would be nice to have some third party competition, but Nikon doesn't cooperate with independents, leaving them to reverse engineer a compatible lens. So far, nothing. The Nikon adapter is reasonably priced and allows the use of a large number of modern Nikon (and some third party) lenses, complete with decently fast center point autofocus. I wish Canon had made as interesting a system as Nikon 1. Something with some original ideas and acceptable performance. Mirrorless APS-C is not "oblivion" nor a "huge blunder." This first EOS M body will seem primitive compared to the models that will be available a few years from now. And those future EOS mirrorless bodies will make today's comparatively large DSLR bodies seem as primitive as a Motorola DynaTAC cell phone does compared to a modern iPhone or Samsung Galaxy. ..and where's a new body? Which forum are you supposed to discuss the EOS M in??? Its going to die in obscurity eventually anyway, why should dpr make a forum for it? I forgot Canon came out with a mirrorless. Well the price of the lens if pretty good. Very frustrating to me that Canon handicaps their mirrorless presence with vin ordinaire products in order to protect their premier cru market. 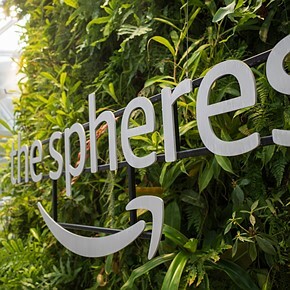 I can understand it as a corporate strategy but it's not without its risks. One of the others could decide to make this a pro market sector and then Canon could find itself out of position in that market. This lens looks far better than vin ordinaire. Get out the Riedel. Oh, right, there still isn't an acceptable body to attach it to. Back to tumblers. funny it looks like Nikons 6.7-13 mm wide angle for the 1 system. Is this the global new lens design, or is it just copy + paste? LOL no U.S. price, Canon is a joke that hasn't made a relevant camera in years, DSLRs are dead and long live M4/3. ijustloveshooting - Canon still doesn't have any APS-C sensor to be as good as OMD's one. Canon doesn't make any new APS-C sensor for last 4 years. Great prices - really? How much does 24-70/4 cost? In my system 28-75/2.8+50/1.4 have the same price. Hippo, Airless,,, don't hate on those that can afford real cameras. You sound like some pauper telling a wealthy man that your cabbage tastes better than his steak,,, just because cabbage is all you can afford,, and you don't know any better. OK ,, that was a terrible analogy,,, I'm just saying,,,, try not being so poor. The 24-70/4 costs a bit more than the Pana 12-35/2.8 but it collects one stop more light. The 24-105/4 costs less than the Panasonic, and beats in in every possible way. Pana 12-35/2.8 collects more light. Don't mix up quantity of light light with DoF. About "24-105/4 beats in in every possible way " - can You prove it, or You just want it to be so? 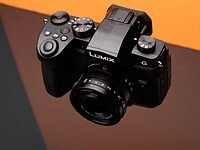 The Panasonic 12-35mm collects 1 stop more light than the 24-70mm f4 but has less DOF for the same equivalent FOV on FF and about the same DOF as the 24-70mm f4 when paired with an APS-C body. However its still one stop faster regardless of what camera you use the 24-70mm f4 on. 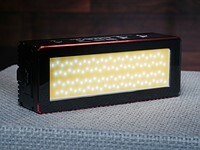 And the OMD sensor has shown to be better than the 18 MP sensor by practically every website which has tested the OMD against the Canon. Depends on how you look at it. Yes, light per unit area is twice as much on 12-35mm f/2.8 on m4/3 vs 24-70mm f/4 on full frame, but sensor is 4 times as large, so 24-70mm f/4 still presents the sensor with twice as much total light, which is all that really matters in the final image. I.e. you shoot with the full frame at higher ISO and get similar noise performance to the m4/3 at lower ISO. 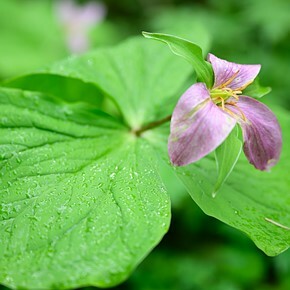 What matters if the shutter speed of the m43 camera is 1/60 seconds @ISO 100 at 12mm f2.8 then the Canon 24-70mm f4 (mounted on FF cam) will be only 1/30 at 24mm f4. Both FOV will be approximately equal. Yes but the FF can use a higher ISO to get that same shutter speed and will still have better noise. The m43 is a quarter of the size so the FF would have to use an ISO of 400 to get the same noise. There are so many variables here that it is almost impossible to come up with an objective comparison. 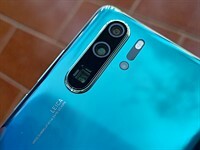 Hippo84's DxOMark scores come close because they measure specific light gathering properties on the cameras that the lenses are likely to be used on. However these measurements tell you absolutely nothing about the look of the images produced! 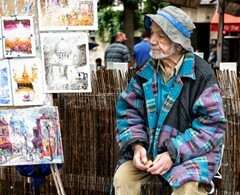 What about contrast, colour rendering, bokeh, curve of focus plane? These need the detailed study of many photos to form an opinion. Anyone who has worked with FF or MF cameras knows the huge advantage in composition that having the big sensor gives through DOF control, but they will also know the big penalty in size, weight and cost. Personally I find APS-C gives just enough of the big sensor image quality while still being small and cheap enough for my use. I think APS-C provides me with the right balance between photo quality and practicality - but everybody's experiences WILL be different.